This article is about arid terrain. It should not be confused with the term "dessert." In geography, a desert is a landscape form or region that receives very little precipitation. More specifically, it is defined as an area that receives an average annual precipitation of less than 250 millimeters (mm) (10 inches (in)). Deserts sometimes contain valuable mineral deposits that were formed in the arid environment or exposed by erosion. Because deserts are so dry, they are ideal places for artifacts and fossils to be preserved. Humans who travel into deserts unprepared, particularly without carrying an adequate supply of water, have a slim chance of survival. The high heat causes rapid loss of water in the form of sweat. Without water, a person in a desert could die of thirst in a couple of days. The words desert in English, désert in French, desierto in Spanish, and deserto in Italian all come from the Latin desertum, meaning "an unpopulated place." A desert is part of a wider classification of regions that, on an average annual basis, have a moisture deficit—that is, they can potentially lose more moisture than they receive. These areas are collectively called drylands, which extend over almost a third of Earth's land surface. Because "desert" is a vague term, the use of dryland—and its subdivisions of hyperarid, arid, semiarid and dry-subhumid—is preferred in some contexts. Deserts where vegetation cover is exceedingly sparse correspond to the 'hyperarid' regions of Earth, where rainfall is exceedingly rare and infrequent. Deserts take up one-third of the Earth's land surface. They usually have a large diurnal and seasonal temperature range, with high daytime temperatures (in summer up to 45° C or 122° F), and low nighttime temperatures (in winter up to 0° C; 32° F) due to extremely low humidity. In the Köppen climate classification system, deserts are classed as (BW). Water acts to trap infrared radiation from both the Sun and the ground. As desert air is dry, it is incapable of blocking sunlight during the day or trapping heat during the night. Thus, during daylight, all of the Sun's heat reaches the ground. As soon as the sun sets, the desert cools quickly by radiating its heat into space. Urban areas in deserts lack large (more than 25°F/14°C) daily temperature ranges, partly due to the urban heat island effect. Many deserts are shielded from rain by rain shadows, mountains blocking the path of precipitation to the desert. Desert landscapes have certain distinctive features. Deserts are often composed of sandy and rocky surfaces. Sand dunes called ergs and stony surfaces called hamada surfaces compose a minority of desert surfaces. Exposures of rocky terrain are typical, and reflect minimal soil development and sparseness of vegetation. Bottomlands may be salt-covered flats. Eolian processes (wind-driven processes) are major factors in shaping desert landscapes. 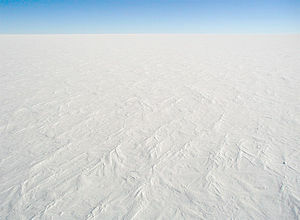 Cold deserts (also known as polar deserts) have similar features, but the main form of precipitation is snow rather than rain. The largest cold desert is Antarctica, which is composed of about 98 percent thick continental ice sheet and two percent barren rock. 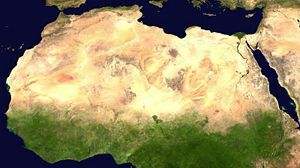 The largest hot desert is the Sahara. High desert in Eastern Oregon, United States. The Agasthiyamalai hills cut off Tirunelveli (India) from the monsoons, creating a rainshadow region. In 1953, geographer Peveril Meigs divided desert regions on Earth into three categories according to the amount of precipitation they received. In this now widely accepted system, extremely arid lands have at least 12 consecutive months without rainfall, arid lands have less than 250 millimeters (10 in) of annual rainfall, and semiarid lands have a mean annual precipitation of between 250 and 500 millimeters (10-20 in). Arid and extremely arid lands are deserts, and semiarid grasslands are generally referred to as steppes. However, lack of rainfall does not by itself provide an accurate description of a desert. For example, Phoenix, Arizona, receives less than 250 millimeters (10 in) of precipitation per year, and it is immediately recognized as being located in a desert. The North Slope of Alaska's Brooks Range also receives less than 250 millimeters (10 in) of precipitation per year, but it is not generally recognized as a desert region. Deserts have moderate to cool winters and hot summers. The difference lies in something termed "potential evapotranspiration." The water budget of an area can be calculated using the formula P-PE+/-S, wherein P is precipitation, PE is potential evapotranspiration rate, and S is amount of surface storage of water. Evapotranspiration is the combination of water loss through atmospheric evaporation and the evaporative loss of water (transpiration) through the life processes of plants. Potential evapotranspiration, then, is the amount of water that could evaporate in any given region. As an example, Tucson, Arizona, receives about 300 millimeters, (12 in), of rain per year, however about 2500 millimeters, (100 in), of water could evaporate over the course of a year. In other words, about eight times more water could evaporate from the region than actually falls. Rates of evapotranspiration in other regions such as Alaska are much lower. Thus, although the latter regions receive minimal precipitation, they should be designated as specifically different from the simple definition of a desert: a place where evaporation exceeds precipitation. With that said, there are different forms of deserts. Cold deserts can be covered in snow; such locations don't receive much precipitation, and what does fall remains frozen as snow pack. These regions are more commonly referred to as tundra, if they have a short season of above-freezing temperatures; or as ice caps, if the temperature remains below freezing year-round, rendering the land almost completely lifeless. Most non-polar deserts are hot because they have little water. Water tends to have a cooling, or at least a moderating, effect in environments where it is plentiful. In some parts of the world, deserts are created by a rain shadow effect, in which air masses lose much of their moisture as they move over a mountain range. Other areas are arid by virtue of being very far from the nearest available sources of moisture (as in some mid-latitude landmass interior locations, particularly in Asia). Montane deserts are arid places at very high altitudes. They are normally cold. The most prominent example is found north of the Himalaya range, especially in the Laddakh region of Jammu and Kashmir (India), in parts of the Kunlun Mountains and the Tibetan Plateau. Many locations within this category have elevations exceeding 3,000 meters (10,000 ft) and the thermal regime can be hemiboreal. These places owe their profound aridity (the average annual precipitation is often less than 40mm/1.5in) to being very far from the nearest available sources of moisture. Rain shadow deserts form when tall mountain ranges block clouds from reaching areas in the direction of the wind. As the air moves over the mountains, it cools and moisture condenses, causing precipitation on the windward side. Moisture almost never reaches the leeward side of the mountain, resulting in a desert. When that air reaches the leeward side, the air is dry, because it has already lost the majority of its moisture. The air then warms, expands, and blows across the desert. The warm air takes with it any remaining small amounts of moisture in the desert. 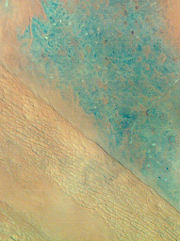 Satellite view of Al-Dahna desert in Saudi Arabia. Different depositional features can be clearly seen. There are several different types of dunes. 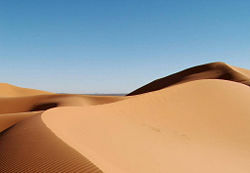 Barchan dunes are produced by strong winds blowing across a level surface and are crescent-shaped. Longitudinal or seif dunes are dunes that are parallel to a strong wind that blows in one general direction. Transverse dunes run at a right angle to the constant wind direction. Star dunes are star-shaped and have several ridges that spread out around a point. Deserts have a reputation for supporting very little life, but in reality deserts often have high biodiversity, including animals that remain hidden during daylight hours to control body temperature or to limit moisture needs. Deserts typically have a plant cover that is sparse but enormously diverse. The Sonoran Desert of the American Southwest has one of the most complex desert vegetation in the Americas. The giant saguaro cacti provide nests for desert birds and serve as "trees" of the desert. Saguaro grow slowly but may live up to 200 years. When nine years old, they are about 15 centimeters (6 in) high. After about 75 years, the cacti develop their first branches. When fully grown, saguaro are 15 meters tall and weigh as much as ten tons. They dot the Sonoran and reinforce the general impression of deserts as cactus-rich land. The shifting sands simulator at Questacon, Canberra. Rain does fall occasionally in deserts, and desert storms are often violent. A record 44 millimeters (1.7 in) of rain once fell within 3 hours in the Sahara. Large Saharan storms may deliver up to one millimeter per minute. Normally dry stream channels, called arroyos or wadis, can quickly fill after heavy rains, and flash floods make these channels dangerous. Though little rain falls in deserts, deserts receive runoff from ephemeral, or short-lived, streams fed considerable quantities of sediment for a day or two. Although most deserts are in basins with closed or interior drainage, a few deserts are crossed by 'exotic' rivers that derive their water from outside the desert. Such rivers infiltrate soils and evaporate large amounts of water on their journeys through the deserts, but their volumes are such that they maintain their continuity. The Nile River, the Colorado River, and the Yellow River are exotic rivers that flow through deserts to deliver their sediments to the sea. Deserts may also have underground springs, rivers, or reservoirs that lay close to the surface, or deep underground. Plants that have not completely adapted to sporadic rainfalls in a desert environment may tap into underground water sources that do not exceed the reach of their root systems. Lakes form where rainfall or meltwater in interior drainage basins is sufficient. Desert lakes are generally shallow, temporary, and salty. Because these lakes are shallow and have a low bottom gradient, wind stress may cause the lake waters to move over many square kilometers. When small lakes dry up, they leave a salt crust or hardpan. The flat area of clay, silt, or sand encrusted with salt that forms is known as a playa. There are more than a hundred playas in North American deserts. Most are relics of large lakes that existed during the last ice age about 12,000 years ago. Lake Bonneville was a 52,000 kilometers2 (20,000 mi²) lake almost 300 meters (1000 ft) deep in Utah, Nevada, and Idaho during the Ice Age. Today the remnants of Lake Bonneville include Utah's Great Salt Lake, Utah Lake, and Sevier Lake. Because playas are arid landforms from a wetter past, they contain useful clues to climatic change. When the occasional precipitation does occur, it erodes the desert rocks quickly and powerfully. Winds are the other factor that erodes deserts—they are slow yet constant. Evaporation in arid lands enriches mineral accumulation in their lakes. Lake beds known as Playas may be sources of mineral deposits formed by evaporation. Water evaporating in closed basins precipitates minerals such as gypsum, salts (including sodium nitrate and sodium chloride), and borates. The minerals formed in these evaporite deposits depend on the composition and temperature of the saline waters at the time of deposition. Significant evaporite resources occur in the Great Basin Desert of the United States, mineral deposits made famous by the "20-mule teams" that once hauled borax-laden wagons from Death Valley to the railroad. Boron, from borax and borate evaporites, is an essential ingredient in the manufacture of glass, enamel, agricultural chemicals, water softeners, and pharmaceuticals. Borates are mined from evaporite deposits at Searles Lake, California, and other desert locations. The total value of chemicals that have been produced from Searles Lake substantially exceeds US$1 billion. The Atacama Desert of South America is unique among the deserts of the world in its great abundance of saline minerals. Sodium nitrate has been mined for explosives and fertilizer in the Atacama since the middle of the nineteenth century. Nearly 3 million tonnes were mined during World War I. Some of the more productive petroleum areas on Earth are found in arid and semiarid regions of Africa and the Middle East, although the oil fields were originally formed in shallow marine environments. Recent climate change has placed these reservoirs in an arid environment. It's noteworthy that Ghawar, the world's largest and most productive oilfield is mostly under the Empty Quarter and Al-Dahna deserts. ↑ What is a Desert? USGS. Retrieved August 15, 2007. Gibbons, Gail. 1999. Deserts. New York, NY: Holiday House. ISBN 0823415198. Sowell, John B. 2001. Desert Ecology. Salt Lake City, UT: University of Utah Press. ISBN 087480678X. Whitford, Walter G. 2002. Ecology of Desert Systems. Burlington, MA: Academic Press. ISBN 0127472614. The Desert Biome. University of California Museum of Paleontology. This page was last modified on 25 October 2017, at 19:18.